I am getting really sick and tired of all this plate spellpower gear being filled with mp5 and no crit. 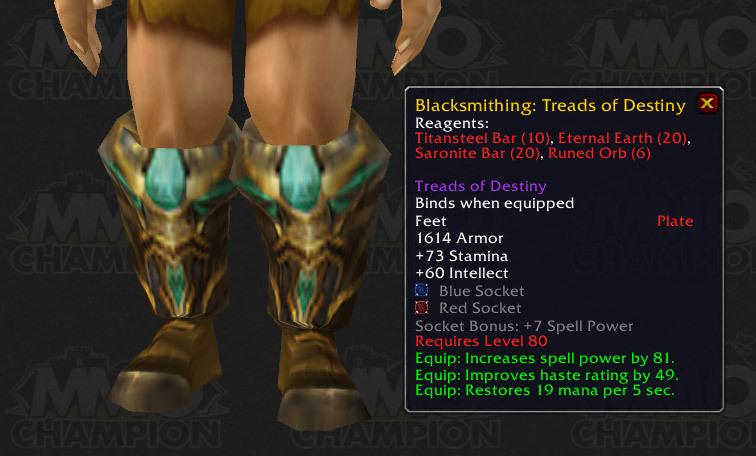 All the craftable piece and all the PvP pieces are terrible for crit spec pallies. I keep on hoping that Blacksmithing will pay off eventually. For being a very expensive profession to level, the rewards in the end seem minimal, and certainly pale in comparison to jewelcrafting’s earning potential. Scratch that – Jewelcrafting, hands down, beats the money-making potential of all other professions combined. As for glyphs, I’ll most likely go Holy Light / Seal of Wisdom / Holy Shock. I’ll swap out Holy Light for Turn Evil for PvP. Perhaps they’re trying to tell us that we’re going to need mp5 as a stat in Ulduar? By the way Siha, you don’t mention the fact that Glyph of Holy Light is apparently going to lose it’s ability to crit. That’s a bit of a disappointment (the change, not the fact that you don’t mention it), but hardly a gamebreaker in my opinion. These new Glyphs are looking pretty interesting indeed! I’m a touch confused on which are minors/majors but I’m really not sure which ones I’ll take. Glyph of BoL is lookin pretty smexy to me, but Glyph of Holy Shock is very nice and will probably beat that out. I’ll have to wait for more information/testing, but I am pretty curious about them.